While I lament the loss of sunlight that comes with daylight saving time, especially as it pertains to the shortening of golf rounds, last year I quickly learned the silver lining of the winter solstice in California: the sunsets. If you’ve lived here for any length of time during this time of year, like I have now, you know there’s something different about sunsets in the late fall. Because of the angle of the sun, atmospheric conditions, etc., the setting sun takes on a new persona, a bit more mysterious and even artistic than the normal classically clean and brilliant California sunset we see most of the year. We’ve already witnessed some of these sunsets in just the first week. One evening it was the setting sun playing peekaboo amongst the clouds, teasing you with glimpses and otherwise casting a brilliant backlight to the broken cloud layer as it made its slow decent. Another night the sun set in a brilliant orange ball that projected an array of hues a bit beyond the summer spectrum. Yet another night, it gave what has become one of my favorite performances: when it drops from a dense cloud layer into that thin atmospheric window before the marine layer and emerges as a hazy red dot for just a few wonderful minutes. These are the sunsets I learned never to give up on last year. And that’s the thing about late fall in the western sky: you just never know. It’s this time of year when California sunsets become like Fourth of July fireworks. You get an occasional dud, but you’re also often surprised by something brilliant. You learn to always cast a glance west at dusk, just in case. The photo at top was taken on one such night. 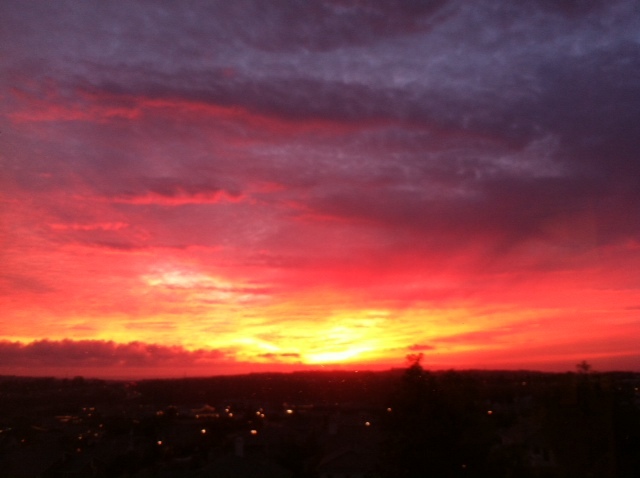 It came after a day when the marine layer lingered all day and nothing suggested a brilliant sunset. Then this. The sun never made a full appearance, but it still managed to announce its presence by casting an incredible kaleidoscope of color and light as it subtly slipped away. Two things about that photo. One, it was taken from an upstairs window, which is a tremendous advantage for enjoying sunsets in general. Having such a view is like having ever-changing contemporary art of your wall. Completely priceless, eternally valuable and inspiring beyond words. Two, if you’ve tried to capture sunsets on your cell phone, as we all have, you know the live image is often many times more beautiful, wonderful and complex than the technology can record. I sometimes send those pics to landlocked friends with the lament, “wish you could’ve been there,” conveying this. When I was on my California scouting trip for my new life in spring of 2013, I frequented art galleries and discovered the vast and diverse world of California sunset/ocean art. I often inquired about what went into capturing those brilliant images and discovered, as is often the case in great photography, that it’s all about lighting and timing, and largely that provided by this time of year. After a year or so of capturing sunsets, it was by looking back at those photos that I truly began to appreciate the seasonal nuances. There’s a stark difference between last fall and, say, my first California summer and in particular my first sunset, which I’ll never forget. I had arrived in LA around noon after seven days on the road. After a trip to the driving range – please tell me you saw that coming – my LA friend and I grabbed a bite on the Santa Monica pier and lingered to enjoy the day. I had been visiting him for four years had observed some great sunsets, enough to realize and appreciate what I was witnessing. As the sunset started to position itself over the pier, it began to descend through a thin cloud lower, a white wanderer in an otherwise clear sky. In anticipation of what was about to happen, there was a camera-carrying rush to the beach. And then it happened. Like an eclipse, the sun seemed to split in two as it passed through the clouds. At its most brilliant, it was hard to argue there weren’t two suns. This mesmerizing effect lasted for maybe 10 minutes before the full sun briefly reappeared to again be swallowed whole by the ocean. I recall sunset enthusiasts approaching each other with gleeful inquiries of “Did you get it? !” and comparing images to appreciate the experience all over again and maybe find an image that shows them something they may have missed. I’ve got a dozen images of that sunset, each one wonderfully nuanced from the one taken seconds before. Yep, I was hooked on California sunsets right there. Still am. Always will be. So tonight I’ll again look to my left at dusk and, camera ready, discover and appreciate what fantastic new way the autumnal California sky has crafted to say goodnight. This entry was tagged California, sunsets, winter solstic. Bookmark the permalink.